It is a major event in Monaco's year and the wife of the sovereign prince is a regular feature there. But no one would have raised an eyebrow had Charlene not been out and about in the cool night air for the traditional boat burning ceremony that takes place the night before the feast of Saint Devota. But just six weeks after giving birth to twins, the princess is devoted to duty. Saint Devota is the patron of Monaco, She was martyred on Corsica in the fourth century and after her death it is said that Christians took her body across the sea to prevent it being burned but they were hit by a storm and a dove guided their boat to Monaco where they came ashore. Fishermen discovered Saint Devota's body and built a chapel in her honour there. It is a big day in this little principality. The feast day of Saint Devota, patron of Monaco, falls on January 27th and the country's royals always take part in events marking the occasion. The evening before there are traditional ceremonies including one that involves setting fire to a boat. And despite only becoming a mum of two six weeks ago, Princess Charlene of Monaco was there to take part in 2015. Here are some of the highlights in photos. Prince Philip has been at the centre of plenty of controversy in his time what with his unerring ability to say things that get everyone else talking. But the nonagenarion consort woke up this morning at the centre of a row not of his making. The decision of Australian Prime Minister, Tony Abbott, to make him a knight of the Order of Australia, has been met with fairly widespread chortling and not a lot of backslapping. 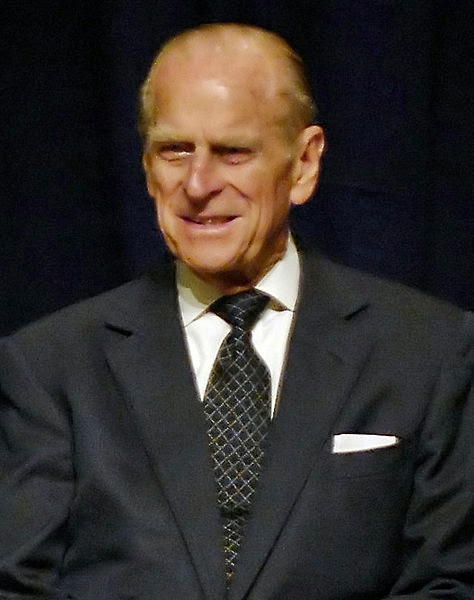 The Duke of Edinburgh has become Sir Philip the Controversial without even trying. The honour was awarded to the duke to mark Australia Day. The title was reinstated last year by Tony Abbott and so far Philip is among five people to receive either a knighthood or damehood. But the other four are all Australians and that's where part of the controversy has started. Johan Martin Ferner was something of an enigma on the European royal scene. His surname is familiar as his wife has it as part of her rather unusual royal title. But the man himself kept things pretty low key. However, his death was announced by the Royal Court to which he was aligned and has made headlines across the continent. Johan Martin Ferner was a man who made royal wedding history. He was the groom at a controversial and unusual royal marriage. 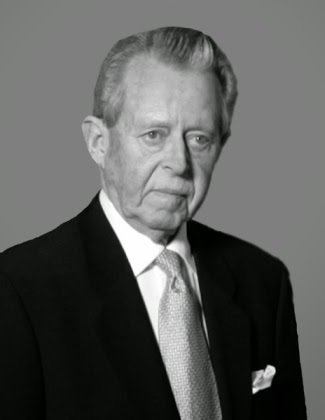 He arrived at the church in Asker, just outside Oslo, on January 12th 1961, and was joined not long afterwards by his bride, Princess Astrid of Norway, daughter of King Olav. They said their vows before hundreds of guests, including members of several European royal families, and left as husband and wife. But there was one very big difference between Mr Ferner and other recent royal bridegrooms. He had been divorced. The royal families of Europe have been out and about braving the elements as a chilly January continues to unfold. And they've shared plenty of images and thoughts on their official social media channels. We've had big birthdays, big coats and big words this week from the royals - here are some of their social media highlights. Happy Birthday to you There were plenty of royal anniversaries being celebrated on social media this week. The biggest birthday wishes were for the Countess of Wessex who turned 50 on January 20th. The British Monarchy Twitter account encouraged everyone to wish Sophie well with the hashtag #HappyBirthdayHRH and shared images of the countess who spent her special day on a series of engagements with her husband. 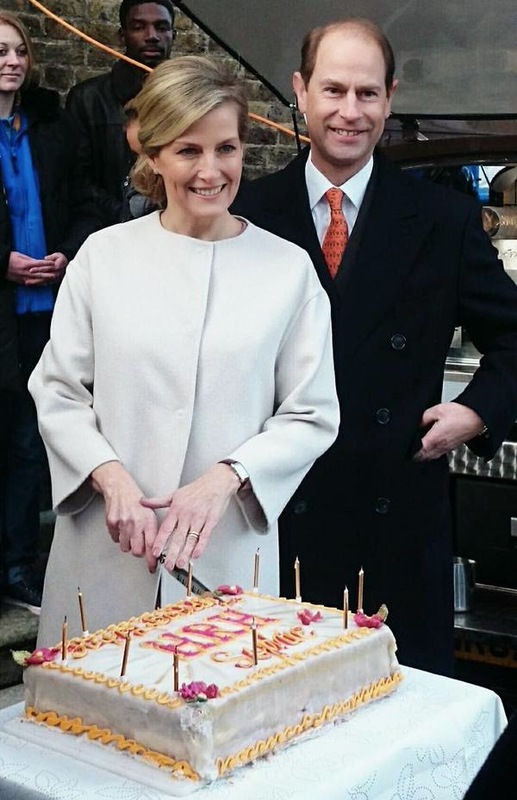 Queen Mathilde of the Belgians turned 42 on the same day. The official Belgian Monarchy Twitter account showed her at her day's engagements - a reception for EU officials at the Royal Palace in Brussels. The new production of Wolf Hall is about to get underway and already there is a debate going on about how realistic, or not, the show looks. And there will no doubt be more in the coming weeks as Mark Rylance and Damian Lewis bring to life the embattled, dark and destructive relationship between Henry VIII and Thomas Cromwell. But is historical reality really a necessity for historical drama? 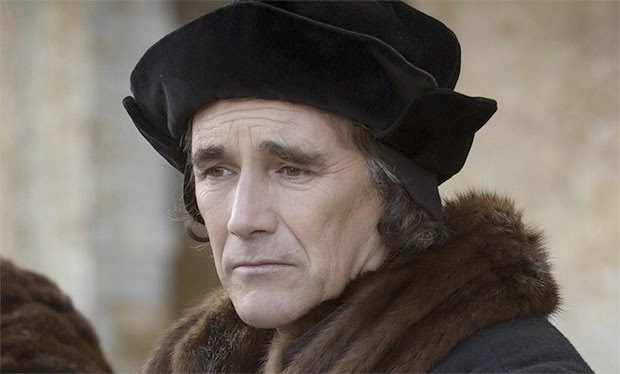 As Wolf Hall gets under way, does a story have to be realistically told to stand a realistic chance of being good? She got a cracker of a birthday cake and wasn't shy about tucking in. She's never looked better and, arguably, has never been more appreciated. As the Countess of Wessex turns fifty there is widespread celebration of her work and a growing realisation that suddenly Sophie is a star and then some. The woman who married into the Royal Family at one of the hardest moments in its recent existence and who could quite easily have become an also ran is now a mainstay of the House of Windsor. Turning fifty really is sweet for the Countess of Wessex. Once upon a time, not really all that long ago, baby blue was the colour for baby girls. And once upon a time, even less of a long time ago, a certain duchess spent the latter part of her pregnancy wearing pale pink and peach and convinced everyone a little princess was on the way only to emerge from her much watched hospital clutching a boy. As Kate of Cambridge enters her final trimester with baby number two, blue has been her colour. So does that mean a little girl will soon be calling Prince George a big brother? 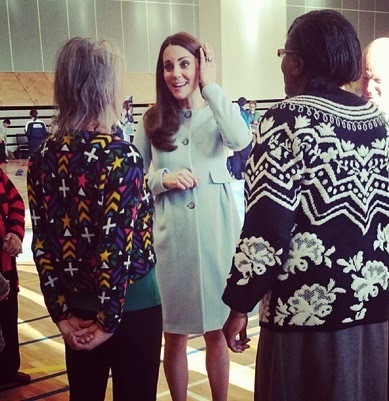 The Duchess of Cambridge has spent the day on a series of engagements in Kensington. Kate began her visits ta Family Friends, a charity which helps disadvantaged families, before heading to Kensington Aldridge Academy and Kensington Leisure Centre. She wore a baby blue coat by Seraphine for the engagements and her bump was noticeably bigger - she is now around six months into her second pregnancy. 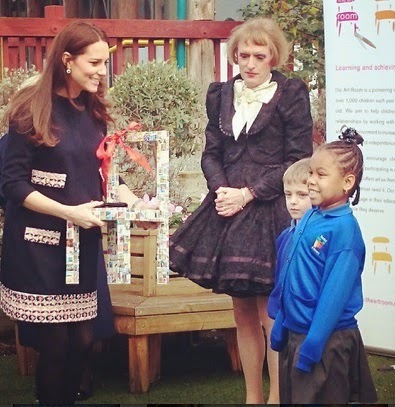 Here are some of the highlights of her day in Kensington - in pictures. It's been a big week in royal social media. Without any warning at all, the Duke and Duchess of Cambridge sent the Twitter-sphere crazy by setting up Twitter and Instagram accounts with Prince Harry. Other things happened too but they were somewhat overlooked as hundreds of thousands flocked to the social media presence royal watchers everywhere have been waiting for. Here's the royal week in media. This is the week that three of the most famous royals in the world went high tech. January 2015 saw Kensington Palace launch a new social media presence that will focus on the Duke and Duchess of Cambridge and Prince Harry. There's a Twitter, Instagram and Storify and all three have been very popular. But so far the Kensington Palace Instagram account has been all about Kate. Of the thirteen picture posted so far, six came from her visit to Barlby Primary School in London on January 15th and five from her engagement at the Fostering Network in the city the following day. 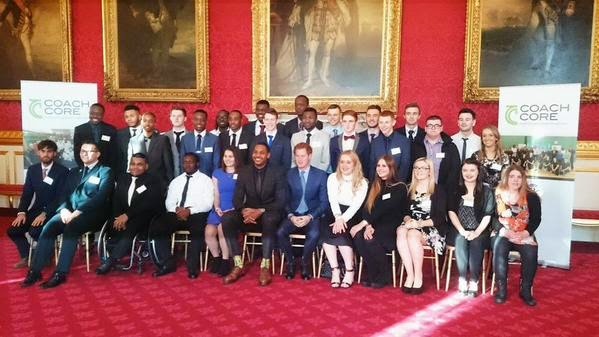 The remaining photos are from Prince Harry's reception for Coach Core at St James' Palace although one of those is an image of the palace itself. It was her second engagement in two days and on Friday the Duchess of Cambridge spent several hours at the Fostering Network in London. The duchess met carers and children who have been placed with families and spent time hearing about the work of the organisation. The outfit was Hobbs and not from its maternity range but worn with similar black tights and heels as the Madderson London outfit from the day before. Here are the highlights of Kate's day in Islington in pictures. The Duchess of Cambridge visited Barlby Primary School on January 15th 2015 to officially name the Clore Art Room there. It's part of Kate's work with the Art Room charity which helps children who are experiencing emotional and behavioural difficulties. The duchess, now approaching six months pregnant, was in a navy dress with bright trim by Madderson London and spent time with many of the children at the school as well as hearing from teachers and helpers. Here are some of the highlights in pictures. Do royals need Christmas portraits? The best royal year yet?